Dinner parties can be quite stressful-- besides the actual cooking itself, you have to worry about how many guests will show up/flake, drinks, plates and utensils, parking for the guests, seating, tardy guests, etc... the list goes on and on. Cooking for a large party is also tricky in that you have to estimate the quantity of ingredients correctly and season adequately for the large batch of food. Guests also arrive sporadically at different times, so you have to think about the timing carefully-- you don't want to serve a warm dish cold, and you also don't want to dry out something by leaving it in the oven for too long (and I've definitely made this mistake before!). 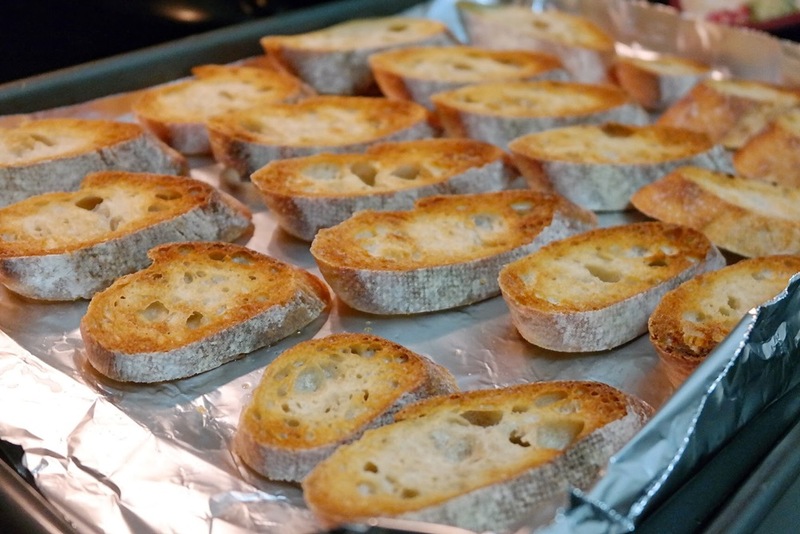 That's why I'm a huge fan of easy party snacks, such as crostini (=little toast in Italian). There are so many different combinations of flavors and textures that you could play with, and once you have the ingredients ready to go, you can take a break while the guests arrive. When the majority of the party arrives, you simply have to toast the crostini for 3-4 minutes, add on the toppings, and serve! This song goes perfectly with this sunny, spring weather! Akdong Musician is one of my all-time favorite groups-- this sibling duo won the second season of K-Pop Star, in which people auditioned all over the world in the hopes of being signed to one of the 3 powerhouses of K-pop: SM, JYP, and YG Entertainment. This duo consists of a 17-year old brother and a 14-year old sister, and they are unbelievably talented. The younger sister, Soo-hyun, has one of the most unique voices in K-pop that just sounds pure and refreshing. The older brother, Chan-hyuk, is a musical genius, and after the duo signed with YG Entertainment, the brother wrote, arranged, and composed all 11 of the songs in their first album, which is very impressive for someone his age! And their title song easily achieved an "all-kill" (meaning they topped all major music charts), evidence of the duo's natural talent. Akdong Musician is definitely a refreshing break from the usual K-pop, which can sometimes seem a bit too mechanical and overproduced. I really commend the chief of YG Entertainment, Yang Hyun Suk, for allowing the siblings to produce their own album. Hope you enjoy this song/MV! 1. If your butter is not softened already, microwave it for 20 seconds to soften it up a bit. Chop the dill and chives and mix them with the butter. Add the lemon zest, lemon juice, Dijon mustard, salt, and black pepper to the butter and mix well. 2. Place the butter in the fridge to let it firm up a bit. You could make the butter a few days ahead of time; just be sure to keep it well-wrapped. A few minutes before serving, bring the butter out of the fridge and let it come to room temperature so that it becomes spreadable. 3. Pre-heat the broiler to "Low." Slice the bread and place on a baking sheet. 4. Place the baking sheet on the top rack, and toast the bread for 3-4 minutes. Leave the door slightly ajar and watch the baking sheet like a hawk. You want the edges of the bread to become golden brown and very crispy without burning. The amount of time between golden brown and burnt is very small, so don't take your eyes off of the bread! 5. 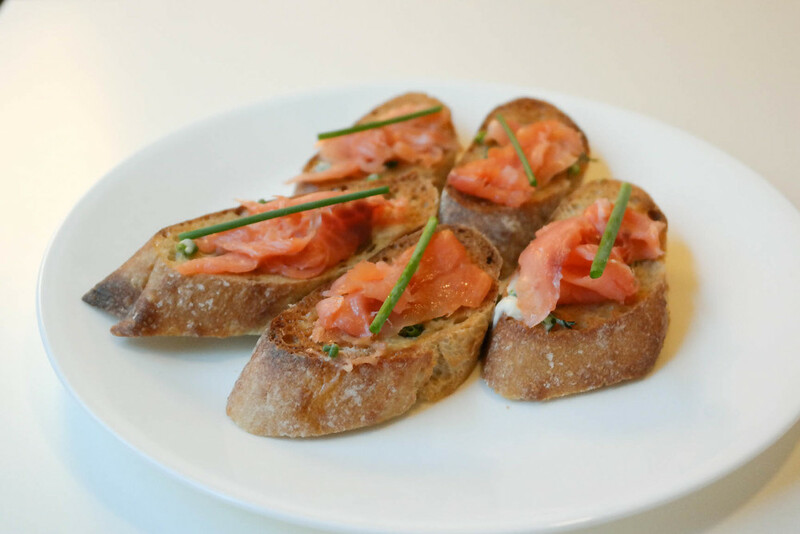 Spread the compound butter on each piece of the crostini, and add a piece of sliced smoked salmon on top. Lay half of a chive on top. Enjoy!